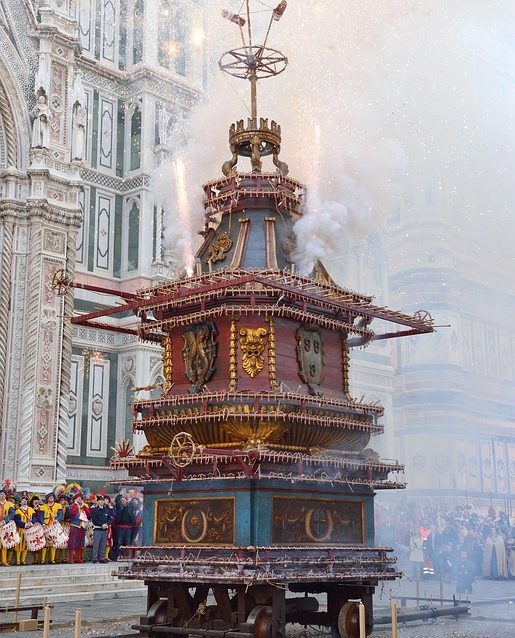 This Easter Sunday, April 21st, make sure not to lose one of the most iconic tradiotions of Florence: the explosion of the float! This ancient recurrence consists in blowing up a decorated float full of fireworks, lit by a rocket in the form of a dove – known as “La Colombina” (meaning The Little Dove) – which runs along a wire that carries it from the inside of the cathedral to to the float placed in the square. Once lit, the Colombina must return, still along the wire, to the starting point inside the church; if it stops before that, or if it even fails to ignite the float, this is considered a bad omen for the coming year’s harvest. One of the last times this happened was in 1966, the year of the famous flood of Florence. The procession will leave at 8.00 am from the deposit in Via del Prato, and will reach the Duomo at about 9.30am. The draw for the matches of the famous Calcio Storico Fiorentino will follow up, and finally at 11.00 “Il Brindellone”, that’s the float nickname, will be blown up.